“There you have it, Gentlemen,” says the old Essex and England warrior, Graham Gooch taking the stage, weathered, stooped and coiled by tendon-tightening age like the veteran of many a campaign that he is. “Blessed if I know how else we can explain Sunil’s mastery of West Indian pace all those years ago?” interupts Gooch. “Looks to be doing them a lot of good, Skip,” interrupts the iconoclast, Bresnan. “What’s the evidence base for this?” asks the team boffin, Collingwood. “Have we tried to get anyone into their camp?” asks Morgan. Seethru Bats? Is Third Man losing his grip? Donald Bradman and George Headley have strong claims to be the best batsmen ever to play cricket. They were born within nine months of each other in August 1908 and May 1909. They were both self taught. As was illustrated here yesterday, they shared a similarly unorthodox stance and grip. 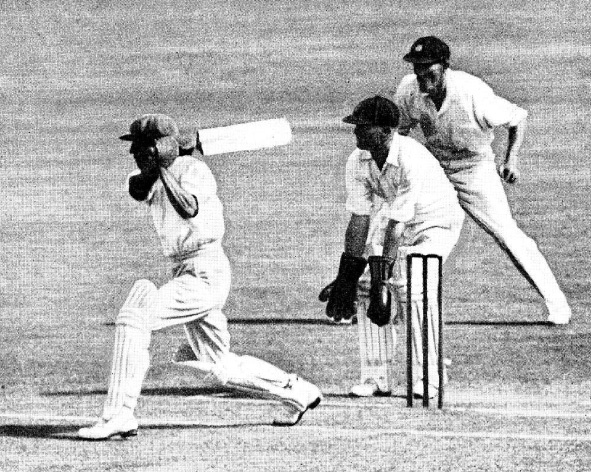 The photograph of Bradman immediately below shows just how far round the back of the handle are his hands. He describes the position of his hands using golfing terms as ‘a slightly shut face’. It looks slightly more than ‘slightly’ to Third Man. Headley’s is an even more extreme version. It has always been argued that, by closing the face in this way, pulls and cuts are struck with a slightly downward facing blade which helps to keep the ball down. It also means that, when driving, the blade cannot continue very far in an open manner. The motion through the line the of the ball is broken by the wrists reaching the end of their orbit. The follow through can only be effected by a rotation at the shoulders. 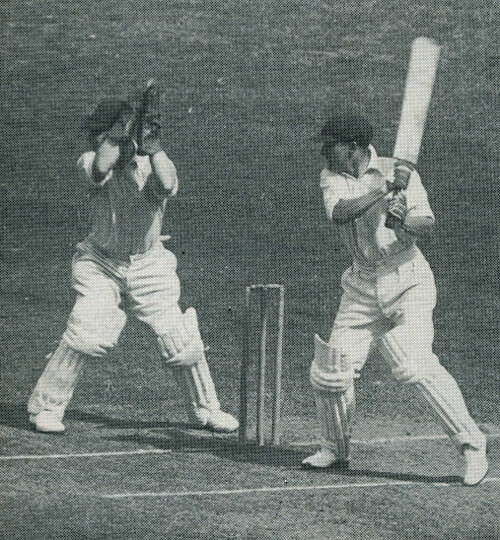 The ‘right hander’s’ right (bottom) elbow quickly rises above the left and the bat, rather than passing over the left shoulder passes more to the side of the left shoulder as the next photograph of Bradman reveals. Even more importantly perhaps, and well illustrated above, the hips open and are aligned from cover to mid-wicket in a very chest-on fashion. This development of alignment is one of the most notable adaptions in T20 but also, unintentionally, seems to be a natural consequence of these extreme grips. 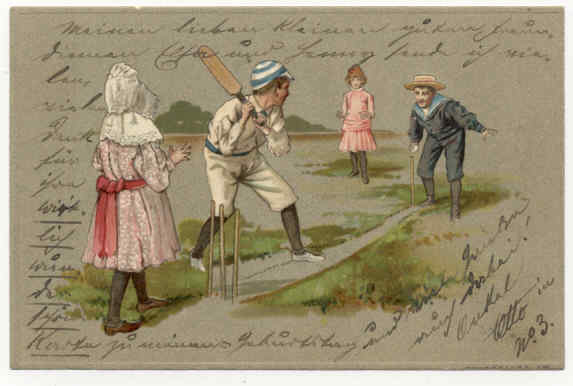 Finally, as this sequence taken from The Art of Cricket to illustrate the ‘jumping out to drive’ shows, throwing the hands into the shot with the wrists in these positions means that the batsman’s head is not ‘over the ball’ as the coaching manuals urge but behind the bat as it strikes the ball. It is as if Bradman, in this case, is looking through the back of his bat as he watches the ball strike the blade. (see the middle shot in the sequence below). Head over the ball? No, it's back and angled, but this enables Bradman to watch the ball through the back of his bat. Which, remarkably, is exactly how Roger Federa plays the forehand and backhand drives. Food for thought? Will a pre-determined striking grip develop with the bottom hand further round behind the line of the drive? Changing a grip is a notoriously tricky and dangerous thing but will batsmen of the future have to have developed more than one grip, following the path trod by the tennis players? George Headley was born in Panama in 1909. He was taken to Jamaica as a Spanish speaking ten year old. There he fell in love with cricket. At 15 and still in the then customary short trousers, he saw Earnest Tyldesley make over three hundred runs in a pre-season match. Destined to go to American to study dentistry George was saved for a future in cricket when he was chosen to play against a visiting English side captained by Lionel Tennyson. He scored 79 in the first match and 211 in the second. Two reasons to be thankful George Headley never got to handle a dentist's drill or our first clue that there is something very odd going on with the grip. 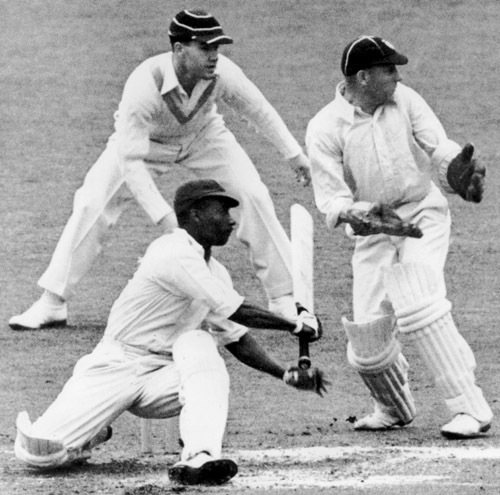 Headley played 22 times for the West Indians and often had to carry the rest of the batting. This led to his nickname; ‘Atlas’. He scored 2,190 runs, ten centuries, eight against England, and averaged 60.83. Aged only thirty, war intervened cruelly in his career surely taking away his best years as a batsman. By then he had scored 9,532 first class runs. He added only 391 runs when cricket resumed after the war, finishing with a first class average of 69.86. Like David Gower, Headley was light framed and had a well trained eye, quick feet and good timing. The first shot we see him play in Part One of the ESCN Legends video at Cricinfo is a sumptuous on-drive played on the walk in a manner strikingly reminiscent of Vivian Richards batting forty years later. The quality of this on drive is even more significant because, on Headley’s first tour to Australia it is said he was ‘worked out’ as an off-side player and the bowlers attacked leg stump with some success. 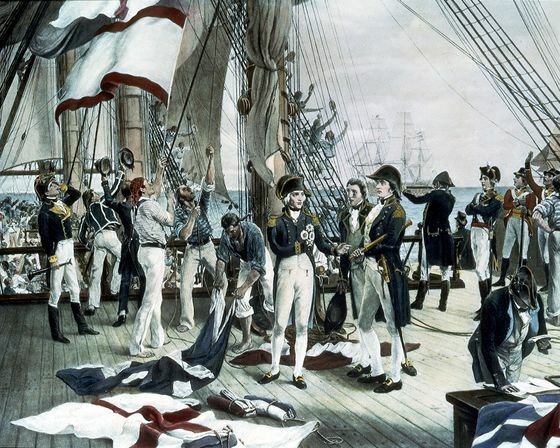 George went into the nets and fixed the problem so effectively that, by the end of the tour, Clarrie Grimmett was saying that George was the best leg-side player he’d ever bowled to. 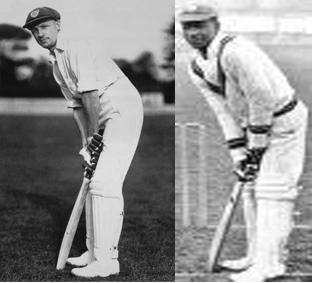 But the comparison Third Man wishes to explore is that between Headley and Bradman’s grip pictured below and their rather circular back lifts. Aplogies for the blurred photo of George but TM has found it hard to find anything but a very small photograph of his stance. Note the way the bat faces inwards which means that the hands are further around the back of the bat with the thumbs of their bottom hands facing in the same direction as the face. Now is the time to get that old bat out from under the stairs or the kit bag out of the car and see how you get on holding at bat like these two remarkable batsmen. And tomorrow, all things permitting, let’s see whether we can work out what it meant for the way they played so well. Support for Third Man’s campaign to restore the Circle Line to its rightful place has been strengthened today by Diogenes’s accurate recollection that Zaheer Abbas, a true Prince among batsmen, had quite a circular back lift. TM would classify it as at least from Paddington to Sloane Square on the Circle Line. Please enjoy this wonderful clip of ‘Z’ and Majid putting on 166 in the 1979 World Cup Semi-final. A Slow-Mo early on gives a good view of the backlift and was that Bill Alley umpiring? YouTube fans of Zaheer are legion. Below he scores 108 off 110 against Australia in the B&H Cup 1981, this time wearing specs. And for addicts here he makes 118 off 86 balls against India in an ODI at Multan in 1982. You may also notice his ‘dip’ of the body just before the ball is delivered. This too is frowned on by conventional coaches because of the danger of moving the head and of shifting balance. But Lara dipped as well. Does it set the batsmen who use it into a sprung coil from which they release themselves into the shot? UNIMPORTANT FACT: Third Man once stayed in Z’s Bristol home in ’73 or ’74, though, the Master Batsman knew very little about it, however he can put on record how very sweet about it he was. By his deed of kindness shall he be known. 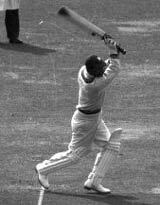 IMPORTANT FACT: Zaheer used a very light bat, never more than 2lb 4oz might at times have been 2/2. TM is looking for a copy of George Headley’s stance. A photograph is pictured on the ESPN Leg Ends of Cricket link given yesterday, but it doesn’t appear easy to find. Any clues, anyone? Perhaps five or six years ago now, Third Man noticed a fine looking young cricketer in the nets. He was about 11 and had been in the County primary school side for two years. The blade came down straight and full faced and the ball was timed to perfection. But the really interesting thing was that the back lift started in the direction of cover point, travelled round in an arc before coming down fairly straight. It was this movement and momentum that was giving him his sense of timing and helping add to the weight of the shot. Bradmanesque? It was said of Bradman that he had both an unorthodox grip and a back lift not unlike this young person’s. Even in the sequence of still shots in his Art of Batting the back lift points to a wide gully. By the following year the young cricketer’s abilities were recognised well enough for him to be invited to join others of similar potential in a North of England squad that spent half a dozen weekends at Headingley. Of course that was exactly what happened. He remains a good player. He has dropped under the radar at Old Trafford but he may yet get another chance, perhaps in the Under 19s. But he hasn’t that interesting back lift and we shall never know what, as an 18 year old, he might have been like. 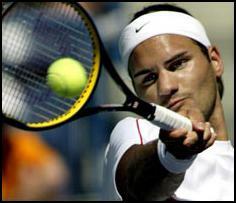 This way of bringing a bat or a racket back and into the down swing in a single movement is how tennis players play the forehand. And TM believes tennis hitting has a great deal to teach cricketers. Third Man was reminded of all this when he found some very interesting footage of George Headley here on Cricinfo. There, larger than life, is the pick-up to cover point. There is some suggestion that it caused him to over balance towards the off but it did deliver in Test cricket a hundred once every four innings and some big ones at that. One never hears of Headley without the comment that he was the black Bradman or that Bradman was the white Headley, but never to TM’s knowledge has someone pointed out that their swings were very similarly unorthodox AND, as we may have a chance to examine tomorrow, there were some very funny things going on with the grip.